IH Concepts takes a customer-centric approach. 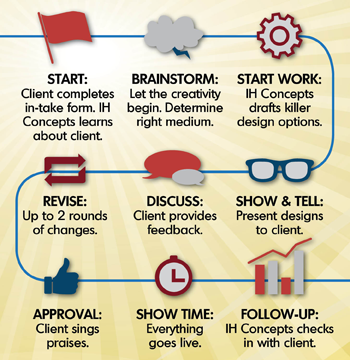 When you hire IH Concepts, you have access to graphic design experts and consultants intent on your success. Our step-by-step process is about saving you time, doing it right the first time, and ensuring that you’re satisfied. From marketing guidance to websites, mobile apps, and print design, you gain vast media opportunities from one provider. You also gain effective solutions that are comprehensive because they merge your goals with your audience’s wants and needs. When you work with IH Concepts, you gain strategic design. This means we examine your business goals, propose designs that complement your message, and concentrate on results. When everything is said and done, you need customers to take action. Our goal at IH Concepts is to help you be successful. Contact us or call 608.906.1250 to discuss your project needs and how we can make success happen for you. Another advantage of IH Concepts is that we complete projects in the context of your brand identity; there are no stand-alone projects. Don’t have a consistent identity? We can help you develop one. Whatever the challenge, we break it down and look at every angle. We use holistic, strategic collaboration to create a road map for your brand’s success. Graphic design is only one part of a marketing journey. Think of the big picture.